If it hadn’t been for Black Sabbath’s ’13, the title for most anticipated and important metal album for the last five years could only have been bestowed on the long awaited, tragically belated fifth offering from Slipknot. The band’s story since 2008’s All Hope is Gone is common knowledge, the loss of two of its most crucial constituent parts threatening to halt the whole machine. 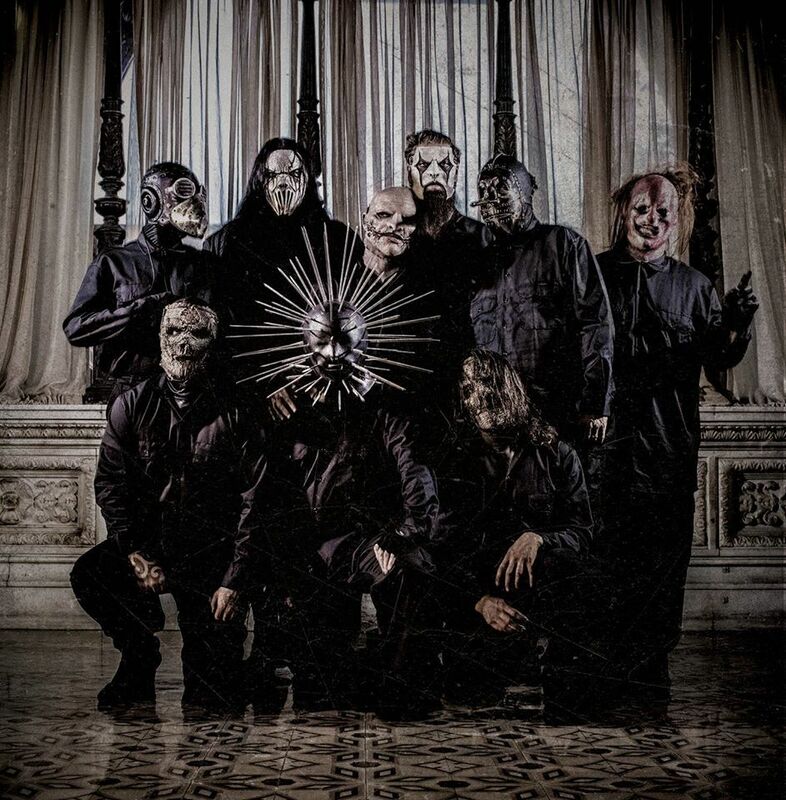 That there even is a fifth Slipknot album is in of itself a triumph, and more than many fans likely hoped for when the news of Paul’s passing first broke. But with Joey Jordison gone too, worries of just how .5: The Gray Chapter will live up to the reputation established by its four immaculate predecessors are understandable. Let such fears be laid to rest. What’s immediately clear is that, despite the band’s lineup changes and the need for members atypical to the central songwriting process to step up, the fire and untempered spirit that characterises all of Slipknot’s best material remains very much alive. At its heaviest it’s as violent and unhinged as their earliest blasts of noise; at its most tender, utterly crushing in its emotional weight. .5: The Gray Chapter is a punishing listen because of both its loudest and quietest moments, and the spectrum of light and shade between them. It’s driven to both extremes by the stop-start barrage of ‘Lech’, pummelling double bass and tortured howls punctuated by aching industrial-crawl interludes; it’s brought together through thick, ripping melody on ‘The One That Kills the Least’. The maggots of old will revel in ‘Nomadic’ and ‘The Negative One’, the riff structures and atonal sampling of which comes closer to the self-titled than anything in the last decade – ‘Custer’, meanwhile, is the pitch-black heart of Iowa reborn, complete with a scream-along hook straining at the leash to fill arenas. The eccentricities and drug trip melodies of Volume 3: The Subliminal Verses are also resurrected here, not least in the keyboard driven funereal prologue ‘XIX’ and nightmarish soundscape interlude ‘Be Prepared for Hell’. Most interesting of all is ‘Killpop’, rising from pseudo-Reznor processed beats and darkly sensual melodic tones to the howls of obsession that characterised the Vermilions and a frenzied closing barrage. Slipknot’s uncanny knack for constructing a hellish ambience through the use of all nine of its members has never really been appreciated, and is used to strong effect here. At their most cerebral they’re near-untouchable, elsewhere some cracks do show; ‘Goodbye’ is beautifully frail up until the half-way mark, its heavier second section failing to bring it to a satisfying conclusion. Likewise ‘Sarcastrophe’, which despite an intriguing ‘Welcome Home (Sanitarium)’-esque intro and some nifty turntables can’t live up to the previous first ‘proper’ songs on Slipknot albums. While the shadow of Paul Gray hanging low over .5: The Gray Chapter is a garish metaphor, his memory has clearly been squarely in the band’s minds through its creation, at times manifesting in direct tribute. The punkish ‘Skeptic’ functions as both a celebration of Gray’s life and a demand issued to God as to why he was taken so young, and it’s thrilling in its vitriolic acclaim. Even more intriguing is the moment where the acid-spitting trash of ‘AOV’ abates to accommodate a melodic bass solo in a haze of echoes and tinkling piano, resulting in one of the album’s most beautiful moments. But if there’s any one component to inevitably be most closely scrutinized, it’s the drumming. Joey Jordison’s hell-for-leather flair and unorthodox style has been one of the group’s trademarks from the start, so the new sticksman had a lot to live up to. Immediate evidence suggests he has sufficient skills and imagination to fit right in, and the wide palette of percussive flair here makes for good credentials. The guitar work may be more reined in than on the last two records (the few-and-far-between guitar solos won’t bowl anyone over) but the resounding return to prominence of Sid Wilson and Craig Jones in the electronic effects department is a welcome one. Corey Taylor, of course, remains one of the best singers in rock full stop, ‘The Devil In I’ in particular benefitting from his equally skilled screaming and singing. As traditionally experimental closer ‘If Rain Is What You Want’ dissipates, a feeling of closure is made manifest. .5: The Gray Chapter works as both a conclusion to the first fifteen years of the Slipknot story and the starting point of a new era for modern metal’s greatest force. Lacking the indefinable magic of the unholy triptych of the self-titled, Iowa and Volume 3, it is at least as good as All Hope is Gone and crucially good enough to live up to the Slipknot name. Tragedy has a way of inspiring those it affects to great things, and the loss of Paul Gray has proven to be another of those moments. His spirit has been made immortal by his brothers, whose latest album is a fitting tribute and an explosive reminder that you cannot kill what you did not create.